Araatris: The spectral wolf turns his nose to sniff at Rhoelyn. ~See with my eyes. The stillness of her body is deceptive.~ His luminous gaze flares. Rhoelyn: Nysse closes her eyes. She gasps and covers her mouth as she gazes at an inky darkness churning violently around Rhoelyn, slowly consuming her. Rhoelyn: ~I do not know. It has grown even as you talked outside. I do not believe you have more than a day or two at most.~ Korran lays his head down. Araatris: The huntress sniffs and settles carefully beside her sister, pulling her into her arms. The priestess barely stirs, but her hands grasp Nysse’s. Rhoelyn: “I’m here, sister,” Nysse’s voice cracks. She closes her eyes, but sleeps fitfully as she wakes many times to check on Rhoe throughout the night. Araatris: Shortly before dawn, the priestess stirs, her lips moving in silent conversation with no one apparent. Korran raises his head, growling. Rhoelyn: Groggily, Nysse raises her head at Korran’s warning. “Good morning, sister. How do you feel?” She takes and squeezes the priestess’ hands. Rhoelyn: Nysse smiles and repeats quietly, “How do you feel, Rhoe?” She frees one of her hands to brush a few stray hairs away from her sister’s face. Araatris: For a long time the elder night elf is silent, the only movement her shift from looking over Nysse’s shoulder to pressing her forehead against it. Araatris: Rhoelyn hesitates for a moment longer before nodding. “I’ll do as you wish, Nysse.” The other night elf smiles, relieved, and hugs her, again. Rhoelyn: “Thank you, Rhoe.” She squeezes her tightly. “We’ll beat this. I know we will.” The huntress releases her, stands, and walks to the table. Araatris: The priestess nods, looking away as her companion carefully snaps the cuffs around her wrists. She pales at the feel of them against her skin. Araatris: Rhoelyn nods and is thwarted from hugging her back by the chains. She chokes out a watery laugh, burying her face against her sister’s shoulder. Rhoelyn: Nysse tugs them back to rest against Korran. “We’ll get those fixed right after my nap. I promise.” The huntress clings to Rhoe in her exhaustion. Araatris: The spirit wolf flops his tail across the both of them as his mistress drifts off to sleep. He watches her sister warily, nosing at her. Rhoelyn: Rhoelyn glares at him. “Stop looking at me like that. It isn’t as if I have to be happy about wearing these,” she hisses. She lays her head down. Araatris: When he just continues to stare, she frowns and tries to turn around to put her back to his head, but he reaches out and nips at her sleeve. Araatris: The spirit wolf shoves his soft nose into her hands and against her chest, rumbling a low sound in the back of his throat. The priestess winces. Rhoelyn: Rhoelyn attempts to pull away, but his heavy head pins her. The sound reverberates through her torso. “Korran, stop!” She whispers urgently. Araatris: When shoving at him for a minute produces no results, she growls. “I said s-!” she stops, staring at the way his fur glows around her hands. 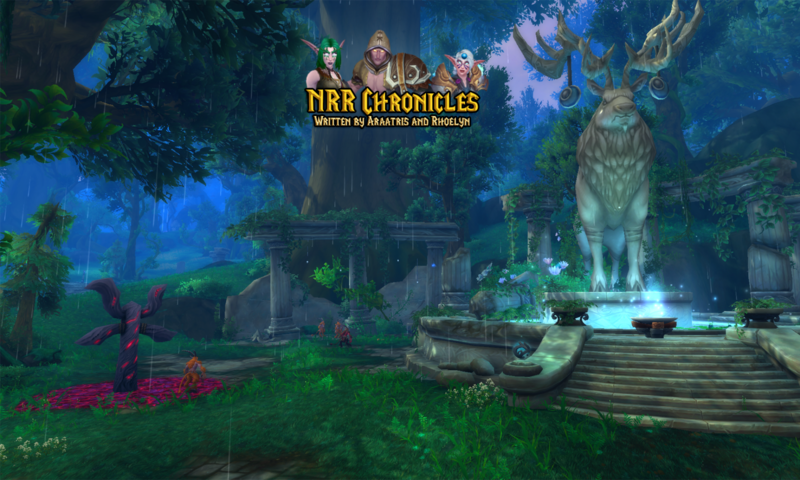 Araatris: “Oh…” The night elf whispers with relief, resting her cheek along his muzzle. “Oh. I see, now. Thank you. I do feel… calmer.” He snorts. Rhoelyn: Korran nudges her towards Nysse and lays his head down. Rhoelyn smiles and whispers, “Yes, that would be a good idea.” She closes her eyes. Araatris: Some time later, they’re woken by a rap at the door. Rhoe shoves herself up, bleary, and pads over to the portal, her chains clinking. Rhoelyn: Nysse groans and raises her head, “Who is it, sister?” Rhoelyn tugs the door open slightly, then seeing Pandaren, she opens the rest of the way. Rhoelyn: Nysse blinks away the sleepiness and quickly stands, straightening herself. “Of course.” Behind her, the massive wolf pushes to his feet and follows. Araatris: Watching the huge wolf with wide eyes, the little woman does so. Korran carefully catches the middle link between his molars and shatters it. Rhoelyn: Nysse rummages through their belongings and pulls out a couple of leather strips. “Here. Let’s make them into bracelets.” The huntress grins. Araatris: With a surly glance at the door, Rhoe shakes her head. “I shall have to make do with brushing my hair.” She at least brushes at her travel gown. Rhoelyn: The huntress blushes and protests even as Rhoe steps behind her. “Awww, Rhoe. It’s not that bad.” She sighs as the tie is tugged from her hair. Rhoelyn: Nysse grasps Rhoe’s hand and they step out. They walk after Hansho, followed by the four others and Korran. The other monks silently watch. Araatris: As before, he leads them out of the building and along the path farther up the compound. The cold wind is biting. Rhoelyn frowns, shivering. Rhoelyn: Nysse flinches and ducks her head. She says nothing as they continue their walk, but tugs Rhoe slightly closer. Her bare arms stinging in the chill. Araatris: When her sister starts to draw breath, her glare sharpening against the monk, the huntress quickly points out a statue visible in a pavilion. Rhoelyn: “He’s beautiful.” She brushes Korran’s fur with her free hand. They reach a building where two monks open the large door as they approach. Araatris: Simpler than the other structures, but somehow more grandiose, the space is only one circular chamber with a raised walkway on its perimeter. Rhoelyn: At the far end, a greying black panda rests cross-legged. His eyes are closed as Hansho leads them across the floor, stopping and bowing deeply. Rhoelyn: Nysse bows and speaks softly. “Good day, elder.” She reaches up and strokes Korran’s muzzle. He rumbles appreciatively and noses her hand. Rhoelyn: “T-thank you, elder. We are honored to meet with you. I’m Nyssera Whispersong and my sister is Rhoelyn Silverwing.” She bites her lip nervously. Araatris: Stern and no-nonsense, he simply nods his head, walking around them in a circle with his staff clicking against the floor. His gaze is piercing. Rhoelyn: The huntress instinctively pulls Rhoelyn into her arms. Her gaze follows him around the room, using Korran’s eyes when he passes out of sight. Rhoelyn: Nysse frowns as well. “Why wouldn’t I? Would you leave your own to suffer? I love my sister. This sha is not her.” She hugs the priestess tighter. Rhoelyn: “She was only angry because the blood elf was… was…” Nysse looks away, unable to finish her sentence. In her arms, the priestess snarls. Araatris: “Leothir will not be allowed to harass my sister further,” Rhoelyn growls. The elder shoves his staff between her and Nysse, unsubtle in his command. Araatris: Her sister looks at her uncertainly, standing still and tense as the elder continues his careful examination. Shadowy smoke wafts over her skin. Rhoelyn: Rhoelyn turns with a frown. The priestess snaps, “I assure you that I’m protecting my sister.” She draws a deep breath when the door opens again. Araatris: The three of them glance back to see Hansho leading Quaed, Nataro and Leothir into the dojo. Rhoe clenches her fists tighter, her skin darkening. Araatris: With a worried look at her sister, the huntress does as ordered, watching carefully as the Horde members approach with Hansho at the lead. Rhoelyn: Hansho once again bows, “I have brought the… Horde, elder.” Wu Lei nods and orders, “Ensure no one disturbs us.” He turns to the new arrivals. Araatris: As the tawny monk makes his way back to the door, the elder offers a bow and introduces himself to the newcomers. Nataro bows politely. Rhoelyn: “You wish to have him ‘cured’ of the sha as well. Why?” The elderly monk’s gaze spears them. Leothir grins broadly and opens his mouth. Rhoelyn: The elder pauses, his gaze settling on the Tauren, “And what is his work?” The end of his staff hits the ground with an audible thump as he waits. Araatris: “And I cannot allow you to sacrifice me to your cause. So more than just Leothir’s rotten personality stands in your way.” Leo growls at her insult. Rhoelyn: Nysse’s eyes widen in distress. “R-rhoe, you knew about they were going to k-kill you? Why didn’t you tell me?” She staggers to her feet. Rhoelyn: “Let go of me, you piece of rot!” Rhoelyn yanks at her arm, but he only grips it tighter. “Not until you say it.” He leans close to her ear. Araatris: “No!” When she rounds at him, swinging one of those dainty little fists at his cheek, he catches her wrist easily. “Let go!” Korran growls. Rhoelyn: Leothir glares at her. “This ‘mage rot’ is trying to convince your sister that she’d be better off with me than that son of a-.” Rhoe gasps. Araatris: “There is NOTHING about you that is better than Rhese!” The priestess yanks against his grip, her cuffs glowing. Darkness wafts around them. Rhoelyn: The huntress flushes purple. “Enough! Both of you!” The wolf leaps and knocks them apart with a swipe of his paw. He hovers over them. Araatris: “I have seen enough.” A new voice rumbles through the room. Korran steps back and lowers his head as a ghostly white tiger appears beside them. Rhoelyn: “W-where do we find it?” Nysse raises to her knees, but still bows her head respectfully. Korran lays next to her and nudges under her arm. Rhoelyn: She hugs Korran. “Of course. Is there anything else, honored spirit?” Her lashes flutter up as she dares another glimpse at the magnificent cat. Rhoelyn: Nysse flushes and buries her face against the wolf’s fur. Wu Lei bows, “As you wish, honored Xuen.” The cat nods, walking even as he fades.